My boyfriend made me sit through this ridiculous, slap stick, canned movie. The Three Stooges were funnier. Perhaps the script was for senior citizens? 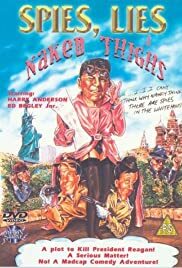 Harry Anderson is predictable in every role, and Ed Begley Jr flat. The wife hysterical and the seductress silly. Harry Anderson as a Government agent here to help us alter the history of our Country as Freddie. Why did they make this movie? They actually got paid for this? And there it is on Cable for my boyfriend to watch while I sit in the background trying not to groan, or slit my throat. It could not be over soon enough. And the fact IMDb wants me to write ten lines about it makes the whole thing worse.